I like to try different things. What can I say? Like most people, I get easily bored doing the same thing over and over. I guess that is why all of my pieces are one-of-a-kind. So, once in a while, rather than designing a piece that is primarily crocheted, I like to use my sewing skills and use crochet to embellish the piece. I say "embellish", but I guess I should clarify I am not using that word to indicate that the crochet is in any way secondary, or just a decorative touch to a completed piece. The "embellishment" is what really makes the design. It's not just the sprinkles on the cupcake, or even the icing on the cake, it's part of the essential "batter" that makes it what it is. For example, a couple of my most recent creations are cuff bracelets. The basic cuff is made from batik cotton fabric, hand sewn to a felt back in a complimentary color. The felt gives the cuff a little body. I created a loop and button closure, using wire and thread to crochet the loop and stitch it into the seam on one end. I originally thought I would machine sew these cuffs, but then I decided that the hand-stitching along the edges could actually become an intrinsic part of the overall, somewhat Bohemian, artisan feeling that I wanted these pieces to have. Using the pattern and colors in the cotton fabric as inspiration, I crocheted embellishments for the cuffs in wire, thread, and beads. I also added hand-embroidered details. Here are my finished pieces: The Cherry Blossom Cuff and The Leafy Fantasy Cuff. The Cherry Blossom Cuff - front/full length view. The Cherry Blossom Cuff - close-up of loop end. For those wondering, the circle motif that is appliqued with embroidery near the bottom edge is made from WireLace Ribbon. The Cherry Blossom Cuff - close-up of mid-section. The Leafy Fantasy Cuff - front/ full-length view. The Leafy Fantasy Cuff - back view. The Leafy Fantasy Cuff - close-up view of the button end. The Leafy Fantasy Cuff - a very close-up view. I came up with a new embroidery stitch pattern while working on this cuff. 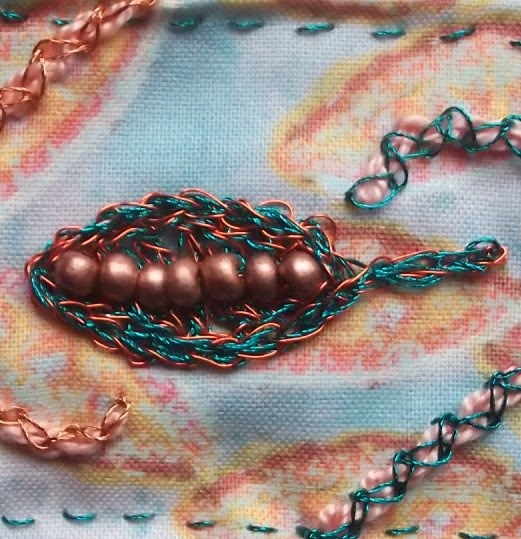 After using peach cotton floss to chain stitch my branching pattern, I oversitched it with a chain stitch that wove diagonally back and forth to each side of original chain. The Leafy Fantasy Cuff - close-up of mid-section. The Leafy Fantasy Cuff - close-up of loop end. If you are interested in seeing a few other examples where I've used crocheted embellishments on fabric, take a look at these little canvas clutch wristlets. My daughter and I hand-painted the canvas fabric using paints that could withstand washing, and then I crocheted embellishments and removable wrist straps. You can also take a look at one of my earlier posts, Kiss Clasp Purses with Crocheted Embellishments, showcasing some little purses I made that featured crocheted beaded embellishments. Creating crocheted embellishments gives you a lot of freedom to play with colors and materials, and to experiment with designs and stitches, without making a big time commitment to a larger project. Go ahead and give it a try! I bet you'll find yourself adding your own imaginative flourishes to all kinds of creative projects.